CATS RECORD BACK TO BACK WINS! 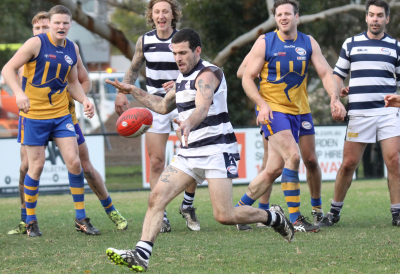 After a solid performance against Wyndhamvale last week the Cats set their sights on consecutive wins, this time away from home against Arch Rivals Sunshine Kangaroos FC. In front of a bumper crowd the boys from Parsons Reserve started slowly but soon hit the scoreboard with goals to Kym Taylor and Todd Finco. Going into the Quarter Time break the cats trailed by 20 points. Albion 2.1.13 to Sunshine 5.3.33. Coach Aaron Tymms must have given the boys a rocket at halftime because they came out with a bang, the skipper snapping a goal and Finco playing like a man possessed kicking 4 more goals to add to his tally. Not to be outdone Kymmy Taylor grabbed himself another and Ross Whelan banged one home to add further punishment to the Catholics. Josh McPherson was prolific in his first senior game this season, Leigh Wilson was racking up posessions while Bench, Kelm and Mills were dominating through the middle. Jason Butina was solid as a rock and helped to nullify the Sunshine attack. Going into the last break the cats lead by 6 goals Albion 14.9.96 Sunshine 8.12.60. The final term saw Finco kick his seventh goal of the day in a truly dominant performance. A goal each to the Davis brothers rounded things off as the Cats cruised to victory 17.12.114 to Sunshine 11.14.80. 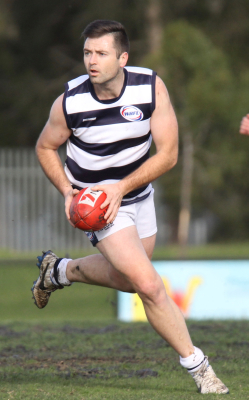 The Catters are pumped after securing consecutive wins, now only a single game outside the top 5 and a win against the reigning premiers Deer Park at John Mcleod oval next Saturday will press our claims even more for our first finals series since 2011. 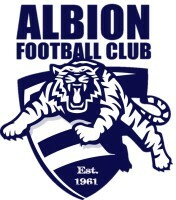 Leigh Wilson was amongest the best players for Albion.